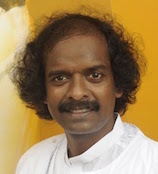 Douglas John was born in 1967 in Solapur. In 1990 he received his degree in B.F.A from J. J. School of Art, Mumbai. In 2009 he received his degree in M.F.A. from Dr. B. A. M. University, Aurangabad. He had ‘Light and Light’ and ‘In Search of Light’ in 2008 and 2014 at Jehangir Art Gallery, Mumbai. In 2003 he showcased solo at Y. B. Chavan Centre, Mumbai. In 1988 and 1989 he participated in group shows at Bajaj Art Gallery. In 1990, 1991, 1994 he showcased in group shows at Artist Centre, Mumbai. In 1991 he participated in a group show organized by Jehangir Art Gallery, Mumbai. In 1992 he had a group show at B.A.R.C., Mumbai. In 1997 he showcased in a group show in Chennai. From 2000 - 2013 he has participated in various group shows in Mumbai, Delhi, Thane and Pune. In 1999 he took part in a Group show at Bombay Art Society, Mumbai. In 2015 he took part in Colours at Jehangir Art Gallery, Mumbai. In 2015 he participated in: The Divine Craftsmen; Meher II - Art for a Cause and Painting Dreams, Coloring Lives at Gallery 7, Kalaghoda in Mumbai. In 1991 he took part in Artist camp organized by B. A. R. C. in Mumbai. In 1992 he participated in Artist camp organized by Artist Centre, Mumbai. In 1998 he attended a workshop on protection of Art objects by Indian conservation institute Sponsored by British council, Mumbai. In 2001 he was invited for workshop on Sea Scape with British Artist Robert King by Indian Maritime Foundation, Mumbai. In 2005, 2008, 2013 he was Invited for a portrait workshop at Swaraj Bhavan, Bhopal. In 2010 he was invited by the Department of Tourism Union Territory Of Dadra and Nagarhaveli for monsoon landscape workshop. In 2015 he was invited by Tribal Art, Department of Culture, Government of Madhya Pradesh; for ‘Different Moods of Shiva’ Simhasth Khumb Mela 2016; permanent display at Ujjain Museum, Madhya Pradesh. In 2015 he designed and executed a sculpture for Former Union Agricultural Minister Shri. Sharad Pawar. In 2015 he was invited by Cultural Department of Madhya Pradesh for Sinhasth Kumbh Mela for National Artist Camp at Treveni Museum, Ujjain. In 2014 and 2016 he was invited for an Art Camp by Ayodhya Shodh Sansthan, Department of Culture and Government of Uttar Pradesh. In 2016 he was invited by Rajasthan Lalit Kala Academy, Department of Culture, Government of Rajasthan for a National Artist Camp at Mount Abu. Douglas lives and works in Mumbai.